What Was The Porsche 944 All About? 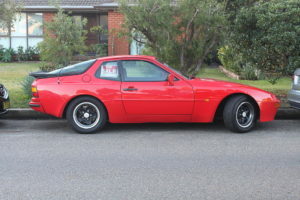 If you are already a Porsche buff I don’t have to tell you how popular the Porsche 944 was and still remains today. If you are knew to Porsche’s your about to meet with some fascinating reading. So what was the 944 all about? Porsche has been building great cars for years but in 1982 it came up with what was going to be a real winner. This was the year the first Porsche 944 hit the market. It was originally introduced as a replacement for the Porsche 924. This eventually did occur but for a few years both cars were actually on the market side by side. From the get go the 944 was immediately a very popular car available as either a 2 door coupe or a 2 door convertible. So what was it that made the 944 such a hit? Well there were a few things but mostly it was the high performance and look of this sports car. It was a success right from the beginning but over the years several models become available including the 944S, 944S2, and the 944 Turbo. When first produced it had only the 2.5 liter engine but over time there were options which also included a 2.7 liter and 3.0 liter engine. Both the 94 inch wheelbase and the 2932 curb weight also made this car very appealing to the sports car enthusiast. When the 944 first hit the streets it had a straight 4 cyclinder 2.5 liter engine an it had Mitsubishi’s patented balance shaft technology. And of course it had the look of a sports car too. It wasn’t until 1985 that it had any major changes done to it. Those changes included some ergonomic changes to the interior, the movement of the antenna, and some improvements to the air conditioning. Optional heated seat were also added, as were powered seats, a larger fuel tank, and some technology to reduce noise. They also introduced the Turbo model in 1985. Within the Porsche Corporation it was referred to as the 951 but the world knew it simply as the 944 Turbo. It had the same basic engine but it was the intercooled version and of course it was turbo charged so you got a whopping 220 BHP at 6000 RPM. 1987 saw the introduction of the 944S – S standing for Super. This model had dual air bags and anti lock brakes as standard equipment. It also had the first 16 valve engine with 250 BHP. 1989 The S was no more to be with the equipment from the S model becoming standard on the 944 model. The engine was replaced to a 4 cylinder 2.7 liter engine. From 1982 to 1989 113,070 were produced and 25,107 Turbo engines were produced. The 944S saw a total of 12,936 cars produced and the 944S2 had only 6,439 produced. In the big picture that’s not a lot of cars which is probably one of the reasons demand remains strong. Late n 1991 the 944 Series 3 was released but the model number was changed to the 968. It was originally called the 944 S3 but then marketing opted for a name change in the hope of increasing sales. Technically the 968 was the refined version of the 944 offering the best of the best. It also offered a new nose and rear end as well as circular headlamps. The 3 liter engine had a horsepower increase of 240 HP and performance was optimized using the Variocam. The 968 was built up until 1995. Even though the 944 designation was retired in 1991it didn’t mean this was a car of the past and it certainly didn’t result in the sales dwindling. Instead it remains more popular than ever. In fact today it remains a “must have” car in the Porsche world.